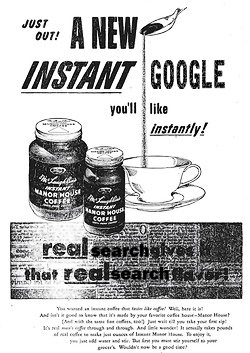 Google Instant is probably the biggest change in the user interface of search engine results pages since search engines were invented and one of the most sophisticated engineering projects for Google. Google Instants lets users type in their search whilst witnessing their results appear & change with every word / correction they type in. Streaming Search Results – relevant search results are displayed as you type. There is no need to press ‘enter/return’ key or click the search button. Predictive text – Google Instant offers predictions of what you are searching for as you type. Scroll to Search – search suggestions/predictions display below the search box and will automatically display those results as you select them with your ‘arrow down’ key. This will make the search process a lost easier and faster, shortening users’ search time by 2 to 5 seconds. For Google, it means more searches being made through them. For users – once they’ve adopted the new technology – it means they will rarely have to make several searches to find the information they’re after. It seems the opportunity is bigger on mobile devices than it is on desktop. Searching on mobile devices is seen as a chore at the moment, with most users giving up if they cannot find what they want quickly. Now that searching will be easier/quicker, the number of impressions and clicks is expected to rise significantly. In fact, analysts such as Marianna Wolk believe that mobile Search CPCs will increase and even exceed desktop CPCs over time. Enjoy…. and if you don’t, don’t forget you can always turn Google Instant off!